The creator of Epic Mickey believes gamers without a Wii should still play the series from the very beginning. Epic Mickey may have had its problems at release, but it still holds a fond place in the hearts of many fans, including creator Warren Spector. While gearing up for the sequel, Spector has also been pushing for a high-definition re-release of the original to give Xbox 360 and PlayStation 3 players the chance to experience the series on their own consoles. During a conversation with Joystiq, Spector revealed that he's already made a pitch to Disney, but isn't sure it will be enough to get the project off the ground. Instead, Spector is asking Disney fans and gamers alike to contact Disney to impress upon them that Epic Mickey HD is a game that should be made available to all. "It's been about four or five days since I've asked to get that project greenlit. It's not my call to make," Spector told Joystiq at Gamescom. "I can't even tell you how much I want to see the first game with all the enhancements and improvements we've made on Xbox 360 and PS3 ... Just have all of your readers send emails to Disney corporation and say: 'Warren should make this game.'" 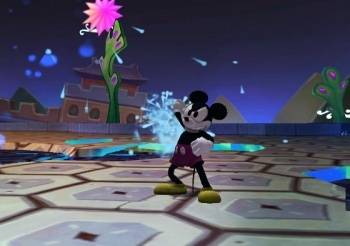 While Epic Mickey was a promising concept, and sold well enough to encourage the development of a sequel, the game received enough gameplay criticisms to make Disney skeptical of investing in a port for other consoles. Spector still believes there is an market for a re-release (his love of classic Disney franchises is proof enough), but that alone may not be enough to convince publishers to sign off on it. "There's only so much clout," Spector continued. "When you're talking about the kind of money games cost now, there's only so much you can do." While most gamers are more familiar with Spector's work on Deus Ex and System Shock, he is also incredibly passionate about Disney properties. Outside of Epic Mickey, Spector also branched out of gaming to write the Duck Tales comic series, a franchise he'd also love to design for if given the chance. "I want to make a duck game and I want to see Epic Mickey on next-gen platforms." If you agree with the man, here's the official Disney Twitter feed for your consideration. And while you're at it, maybe put in a good word for that Duck Tales game.